Sunday is a day where families go for their weekend groceries shopping. Well, for me it's more of going to my nearest shopping complex, Jusco Wangsa Maju for a food binge. For dinner tonight, I had McDonald's! Remind me not to make this a habit, since I do want to slim down. I found out the prosperity burger is still available, but with a new addition. 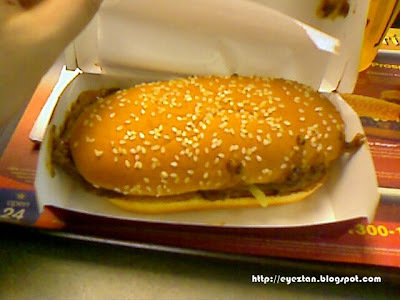 All this while, McD's prosperity burger came only in beef. My partner does not eat beef due to religious reasons. This time the prosperity burger came in chicken flavor as well, which we promptly ordered. I wanted the fried chicken, but they don't have chicken thighs, so I changed my order to a chicken mcdeluxe burger. 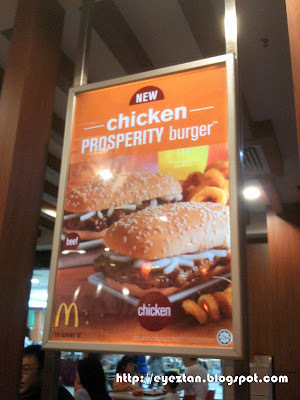 The prosperity burger itself was delicious, especially with the sauce it came with. The black pepper sauce was overflowing and gave a rather strong taste to the burger. It was ok for me, but when my partner took a bite, she complaint it was too spicy for her liking. Oh well, you can't please everyone all the time.